277 Marlborough is located on the north side of Marlborough, between Exeter and Fairfield, with 275 Marlborough to the east and 279 Marlborough to the west. 277 Marlborough was designed and built ca. 1873 by Frederick B. Pope, for speculative sale, one of two contiguous houses (277-279 Marlborough). They were originally designed as a symmetrical pair, but the upper stories of 277 Marlborough were later remodeled and expanded. The land on which 277-279 Marlborough were built was purchased by Frederick Pope on March 5, 1872, from real estate dealer Henry Whitwell. At the same time, he also purchased an equivalent lot from Henry Whitwell across the alley, fronting on Beacon, where he built 343–345 Beacon. The land was part of a larger parcel originally purchased from the Boston Water Power Company on February 16, 1863, by Daniel Davies, Jarvis Dwight Braman, and Grenville Temple Winthrop Braman. Grenville Braman was treasurer of the Boston Water Power Company, Jarvis Braman was his brother (and later president of the company), and Daniel Davies, a housewright and master carpenter, was Grenville Braman’s father-in-law. Click here for an index to the deeds for 277 Marlborough. Detail from the 1888 Bromley map, showing the stables behind 277-279 Marlborough and 343 Beacon. 277-279 Marlborough were each built with a stable at the rear, on the alley. These appear to be the only stables constructed on Marlborough, where the lots are less deep than on the north side of Beacon and on Commonwealth. Because of the size of the lots, the houses at 277-279 Marlborough were less deep than the neighboring buildings to allow a rear yard between the house and the stable. In late-1875, George Norman, who owned 343 Beacon across the alley, had a stable built behind his house. The lots on the south side of Beacon are the same depth as those on Marlborough and 343-345 Beacon had been built at a normal depth; as a result, the new stable occupied virtually all of the rear yard. 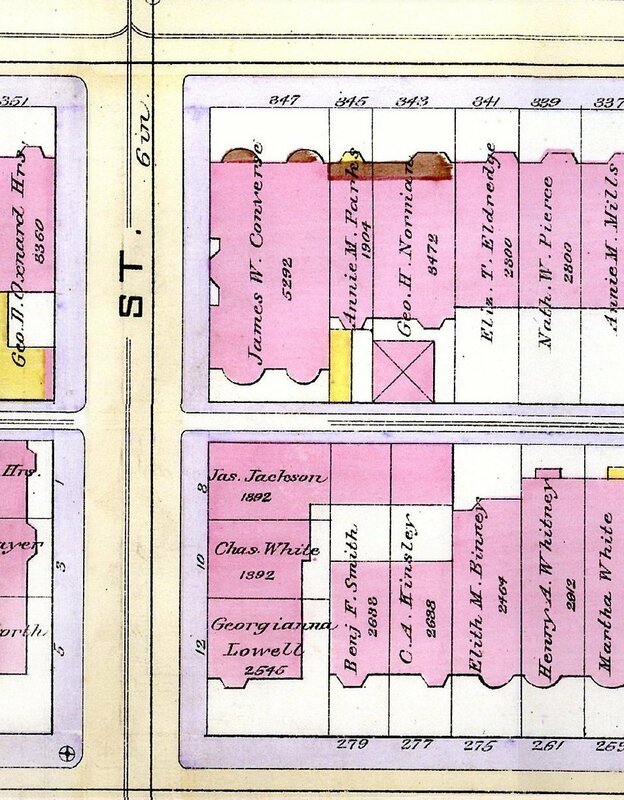 The decision to build stables on these properties may have been facilitated by the fact that the lots were on land originally sold by the Boston Water Power Company whereas the land further east was originally owned by the Commonwealth of Massachusetts (the north-south dividing line was at the eastern boundary of the lots at 277 Marlborough and 343 Beacon). The deeds from the Commonwealth included a prohibition that the land “…shall not, in any event, be used for a stable..,” and, although the Commissioners on the Back Bay had clarified in 1858 that this did not preclude the building of “private stables by gentlemen as appurtenances to their own dwelling homes,” there remained uncertainty and controversy as to their permissibility on land originally owned by the Commonwealth. By contrast, the Boston Water Power Company deed for the land on which 277-279 Marlborough and 343 Beacon were built specified that the land “shall not be used for a livery stable,” making it clear that private stables were permissible. Click here for more information on the Back Bay deed restrictions. After they were completed, 277-279 Marlborough remained unsold for several years. They were subject to several mortgages which were foreclosed by George A. Gibson in the fall of 1875 and by the Essex Savings Bank in early 1876. On March 15, 1876, 277 Marlborough was purchased by Dr. August P Lighthill, an oculist and aurist. He and his wife, Ellen (Fleming) Briard Lighthill, lived in Cambridgeport. On April 3, 1876, 277 Marlborough was purchased from August Lighthill by George H. Norman. He and his wife, Abbie (Durfee Kinsley) Norman, lived at 343 Beacon, across the alley (where they had just built a stable). Their primary residence was Belair in Newport. George Norman was co-founder of the Newport Daily News, which he managed for a number of years. He then became a civil engineer, and was the successful designer and builder of numerous gas works and water works throughout the country, including the water distribution system for Newport. On November 13, 1876, 277 Marlborough was acquired from George Norman by Calista Adelaide (Billings) Kinsley, the wife of Edward Wilkinson Kinsley. In 1876, they had lived at 79 Rutland. George Norman’s wife, Abbie (Durfee Kinsley) Norman, had been adopted by her maternal aunt and uncle, Abbie (Durfee) Kinsley and Rufus Bent Kinsley. Rufus Bent Kinsley was Edward Kinsley’s first cousin, once removed (Edward Kinsley’s grandfather, Rodolphus Kinsley, and Rufus Kinsley’s father, Silas Kinsley, were brothers). Edward Kinsley was a wool dealer and, from 1878, a member of the Massachusetts State Railroad Commission. The Kinsleys continued to live at 277 Marlborough during the 1882-1883 winter season, but were living elsewhere for the next two seasons. During the 1883-1884 winter season, it was the home of Robert Bacon. It was not listed in the 1885 Blue Book. By the 1885-1886 winter season, the Kinsleys were living at 277 Marlborough again. By the 1890-1891 winter season, they had been joined by their son-in-law and daughter, Alfred W. Carr and Adelaide Peabody (Kinsley) Carr. They continued to live at 277 Marlborough until Edward Kinsley’s death in December of 1891. After his death, Calista Kinsley, their unmarried daughter, Mary Louise Kinsley, and Alfred and Adelaide (Kinsley) Carr, moved to Brookline. The house was not listed in the 1892-1894 Blue Books. On August 12, 1892, 277 Marlborough was purchased from Calista Kinsley by Augustus Peabody Loring and his wife, Ellen (Gardner) Loring. They also maintained a home in Prides Crossing. Augustus Loring was an attorney and was president of the Plymouth Cordage Company. He also served as a member of the Massachusetts State Senate. 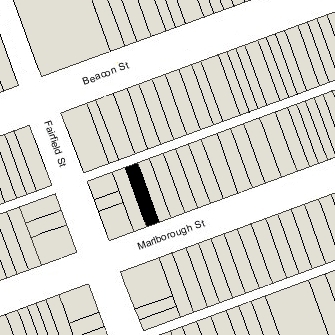 On March 20, 1903, the Lorings entered into a party wall agreement with Mary Robeson, owner of 279 Marlborough (there appears to have been no previous agreement between the owners of these houses because they were both built by the same owner). On July 10, 1907, they amended the agreement to clarify that “there shall be no limitation by reason of said former agreement, express or implied, upon the height to which a party wall may be constructed…”. Soon thereafter, the Lorings remodeled their house to add another story (the house is shown as three stories on the 1908 Bromley map and as four stories on the 1912 map). The Lorings continued to live at 277 Marlborough until their deaths: Ellen Loring in November of 1937 and Augustus Loring in March of 1938. On September 2, 1938, 277 Marlborough was purchased from the Loring estate by Knud Nelsen Knudsen, a wood carver and instrument maker, and his wife, Alma (Petersen) Knudsen. They previously had lived at 842 Beacon. The Knudsens operated 277 Marlborough as a lodging house. They continued to live there until about 1970. By then, and probably for many years before, the carriage house at the rear of the property had been converted into a single-family dwelling. On April 10, 1970, 277 Marlborough was purchased from the Knudsens by John E. Bennett and Alvan Brody, trustees of the Joy Investment Trust. It continued to be operated as a lodging house. On April 10, 1972, J. Richard Belanger purchased 277 Marlborough from John Bennett and Alvan Brody. On September 29, 1975, John Bennett foreclosed on J. Richard Belanger’s mortgage and took possession of the property as trustee of the Judith Realty Trust. He continued to operate 277 Marlborough as a lodging house. On November 9, 1978, 277 Marlborough was purchased from John Bennett by Back Bay Aging Concerns Committee – Young and Old United, Inc. They operated the property as a lodging house intended for elderly and low income residents, with the carriage house at the rear used as the property manager’s residence. 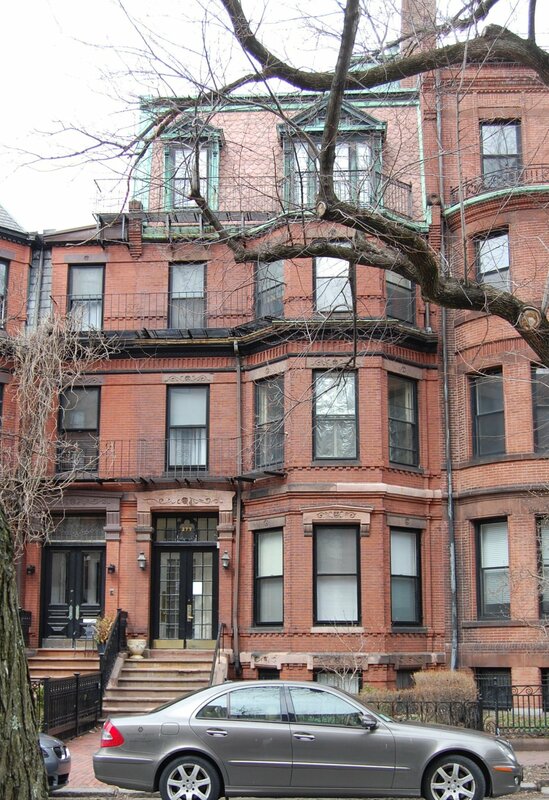 On December 4, 2009, the Massachusetts Preservation Corporation purchased 277 Marlborough from Boston Aging Concerns – Young and Old United, Inc. 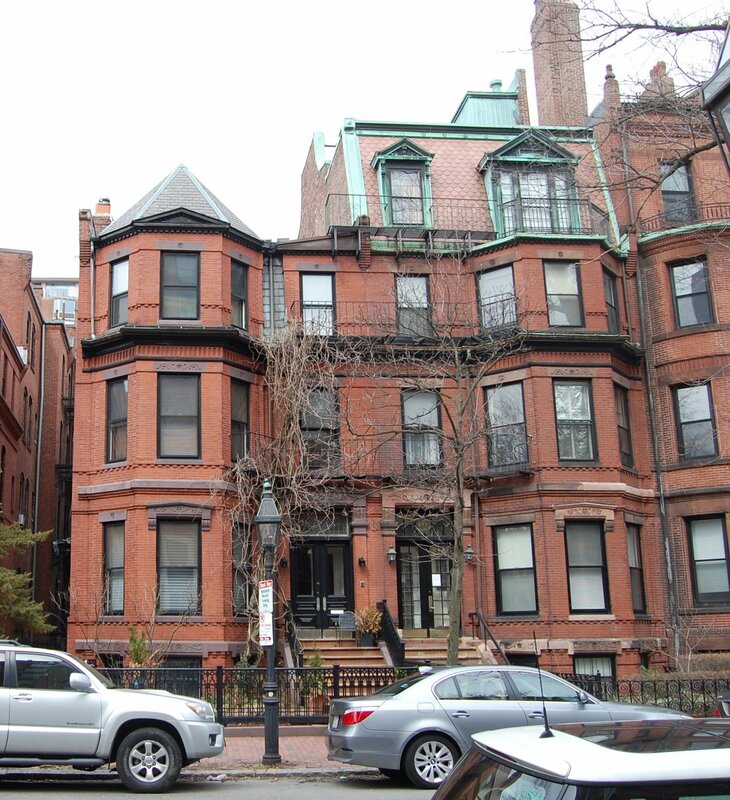 The purchase was subject to affordable housing restrictions entered into between Back Bay Aging Concerns and the Boston Department of Neighborhood Development. In April of 2012, the Massachusetts Preservation Corporation transferred 277 Marlborough to the Marlborough Lending LLC “in lieu of foreclosure” of the mortgage held by Massachusetts Lending. 277 Marlborough remained a lodging house in 2015.